A five-gallon isolation tank set up for individual behavioral observations. Note that this photograph was taken post fry release (photograph courtesy of Kelsey Wood). All behavior data was collected using Jwatcher, a freely available Java based program. In vertebrate species where investment in parental care is important, the Challenge Hypothesis (Wingfield, 1990) predicts that androgen concentrations are maintained at sub-threshold levels and increase only in response to a territorial intrusion. However, the Challenge Hypothesis was first proposed in relationship to male birds, and while its assumptions have been tested in other species, it has rarely been applied to female teleost fish. 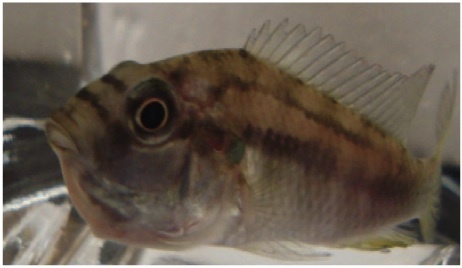 The current study focuses on a territorial and maternal mouth-brooding cichlid fish, Astatotilapia burtoni, and seeks to answer three questions. Q2: Given that hormone concentrations have been shown to vary between mouth-brooding cichlids at different points throughout the reproductive cycle (Martin et. al 2004, Carleton 2009), will there be a response to challenge between two different time points? Q3: Since maternal patterns of behavior vary between wild-stock and lab-stock A. burtoni (Renn 2009), will there be a different response to challenge between two different stocks of fish? Female Astatotilapia burtoni, a species of mouth-brooding cichlid fish native to Lake Tanganyika in Africa, were used in this study. Two distinct populations of this fish were maintained. The laboratory stock (LS) were descended from a population of fish originally collected from the north-end of the lake in 1977 and subsequently maintained under laboratory conditions. The wild stock (WS) were either one or two generations removed from a population of fish that had been recently collected from the south-end of the lake in 2005. Behavioral data and blood samples were taken six days into the brooding cycle and one day post fry release from wild-stock and lab-stock females that were either presented with a conspecific intruder or were not challenged. A female specific ethogram (see below) was used to quantify behaviors during a 10 minute observation perdiod using JWatcher software. In total, 31 fish were observed and sacrificed for this study. 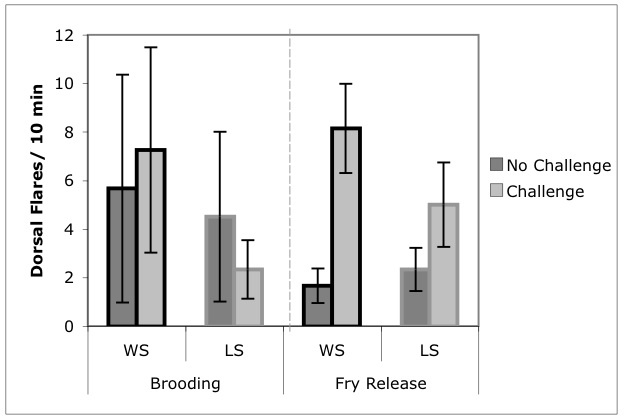 Results showed that wild-stock females attacked intruders more frequently upon fry-release than did lab-stock females. Also, while other maternal and aggressive behaviors did not vary significantly between challenged and non-challenged females, trends existed which indicate that upon challenge, wild-stock fish frequently displayed their dorsal fin and spent more time guarding the nest compared to lab-stock fish. 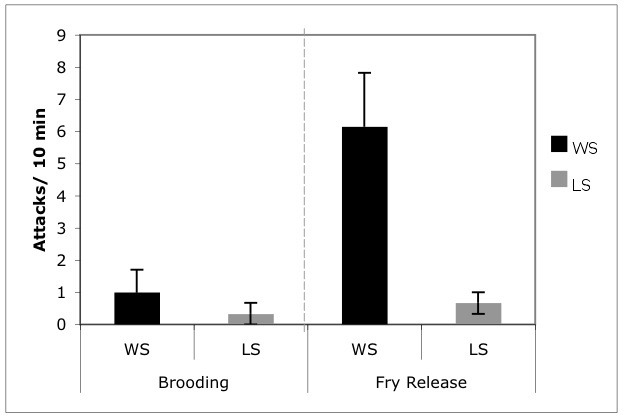 Average number of times WS and LS females attacked a conspecific intruder six days post-spawning and one day post-fry release during 10-minute focal observations. The proportion of time WS and LS females spent flaring their dorsal fin when challenged and not challenged. Ten-minute focal observations were conducted six days post-spawning and one day post fry release. Circulating testosterone levels were determined for plasma samples by running a testosterone ELISA (Assay Designs).Though there was no statistically significant hormonal response to challenge, females that released their fry had higher testosterone concentrations than brooding females. Due to the high degree of individual variability within each experimental group, I decided to perform regression analyses that compared the potential relationship between the behavior of each individual and testosterone concentration. There were no significant positive correlations between flaring, eyebar, guarding, and nest behavior and testosterone concentration. For attack behavior, while the correlation with testosterone concentration was not statistically significant when all females were considered, the fact that the two stocks differed with respect to attack frequency was addressed for each stock independently. Here, the frequency of attacks against an intruder in LS females tended to correlate with testosterone. 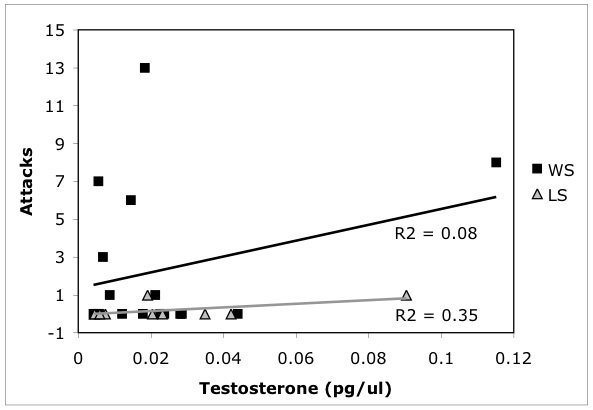 Relationship between testosterone concentration and number of attacks by stock. Conclusions: The behavioral responses in this study were not sufficient to elicit a significant hormonal response compared to past studies in maternal A. burtoni. There are a couple reasons why this might have been the case. For one, a great proportion of the fish used in this study were a couple generations removed from pure wild-stock fish as compared to Tanner’s experiment, where females were only one generation removed from pure wild-stock fish. There is the possibility that in two generations' time, the lab had incidentally selected for fish that were less aggressive than in previous stocks, though behavioral differences between these generations have not been noticed previously. Secondly, Tanner’s fish were maintained in 15-gallon isolation tanks compared to the five-gallon isolation tanks used here, suggesting that the minimum space threshold needed in order to successfully establish a territory and show a full repertoire of behaviors may have been crossed. Also, most of the females selected for in this study were young females that had not yet raised their first brood. 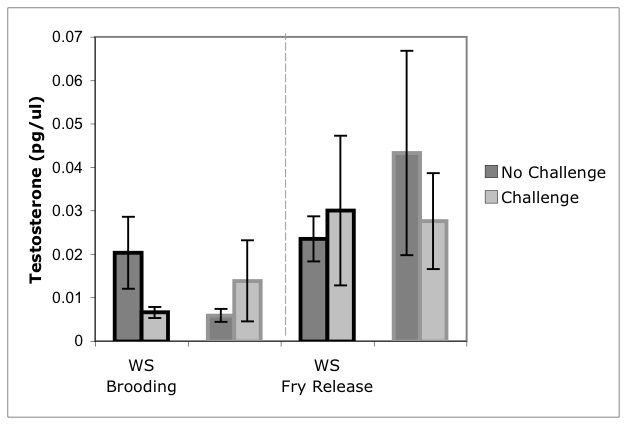 Older female mouth-brooders that had raised several broods in the past may be more invested in insuring that the fry survive and may therefore attack intruders more frequently than younger fish. Finally, the intruders that were selected for in this study were smaller than those in Tanner’s study and may not have presented a sufficient enough of a threat to the maternal females. While both the current study and the Tanner study isolated females prior to territory challenge, it should be noted that isolation can affect hormone responses. Carleton, J. B. (2009). "The expression profile of maternal behavior in A. burtoni." Reed College Thesis. Martin, J. (2004). "Hormonal and physiological profiles of female Haplochromis burtoni as it relates to affiliative behavior." Stanford Undergraduate Research Journal Spring: 55-61. Renn, S. C. P., J. B. Carleton, et al. (2009). "Maternal care and altered social phenotype in a recently collected stock of Astatotilapia burtoni cichlid fish." Integrative and Comparative Biology 49(6): 660-673. Tanner, A. C. W. (2009). 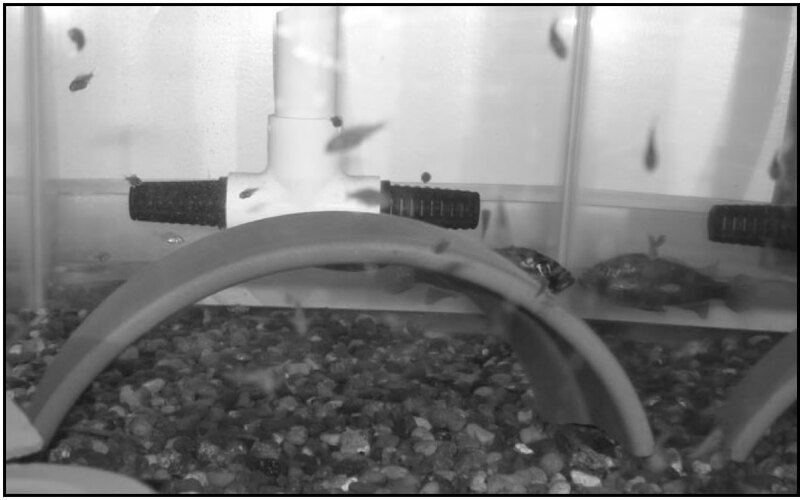 "Challenges in Motherhood:Support for the Challenge Hypothesis in Maternal Astatotilapia burtoni." Reed College Thesis. Wingfield, J. C., R. E. Hegner, et al. (1990). "The Challenge Hypothesis - Theoretical Implications for Patterns of Testosterone Secretion, Mating Systems, and Breeding Strategies." American Naturalist 136(6): 829-846.